“Great cities have a great park”—that’s the mantra of our visionary client group behind Bonnet Springs Park in Lakeland, Florida. For more than 30 years, the 180-acre site has gone through a number of attempts to establish its best use. At long last, in early 2015, David Bunch, a longtime Lakeland Realtor, and his wife Jean presented a bold concept to philanthropists Barney and Carol Barnett, generous benefactors who care about the future of Lakeland. Their vision? To create a special public place near downtown Lakeland that the community could enjoy, and make positive use of this underutilized land. 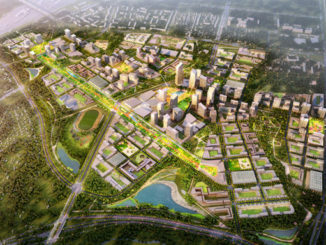 With this vision in mind, they agreed to underwrite the assembly of the railyards and available nearby properties, the environmental remediation, and general enabling of the creation of what is now called Bonnet Springs Park. Bill Tinsley, a passionate Lakeland community member who devoted his career to creating great parks as the former Lakeland Parks and Recreation Director, joined the project to help lead the master plan process. The Tinsley and Bunch families—alongside the Barnetts who were joined by son’s Wesley and Nicholas—added a 20-person advisory committee comprised of a diverse group of local community advocates. Already, the project has had a transformative effect on the adjoining neighborhoods through the removal of 37 tons of accumulated trash to ready the site for transformation. 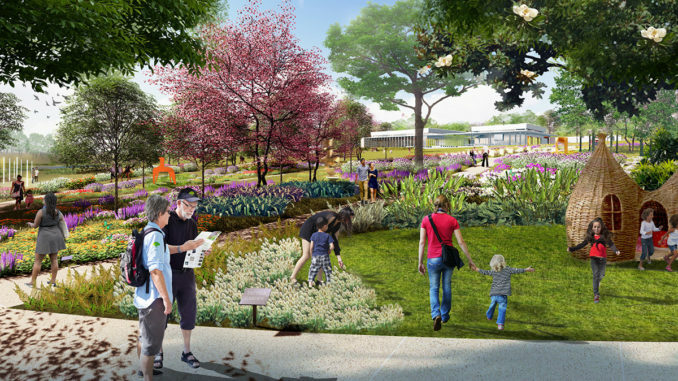 The project is now poised to begin environmental remediation, a foundational step in carrying forward an aspirational design to create this exemplary and vibrant destination park. 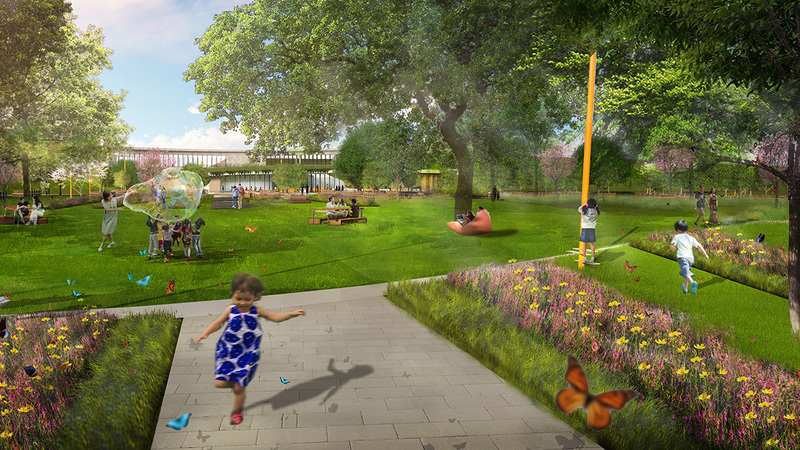 The Bonnet Springs Park Board selected Sasaki in 2017 to design the privately funded park, heal the environmental damage that came from years of industrial use, and ultimately transform the site into one of the greatest urban landscapes in the country. Since that time, Sasaki’s interdisciplinary team of designers, Zach Chrisco, PE; Christine Dunn, AIA; Anna Cawrse, PLA; Andrew Gutterman, ASLA and Jill Allen Dixon, AICP have sourced input and feedback from the Lakeland community and incorporated ideas and desires from more than 400 people into the design for the park. 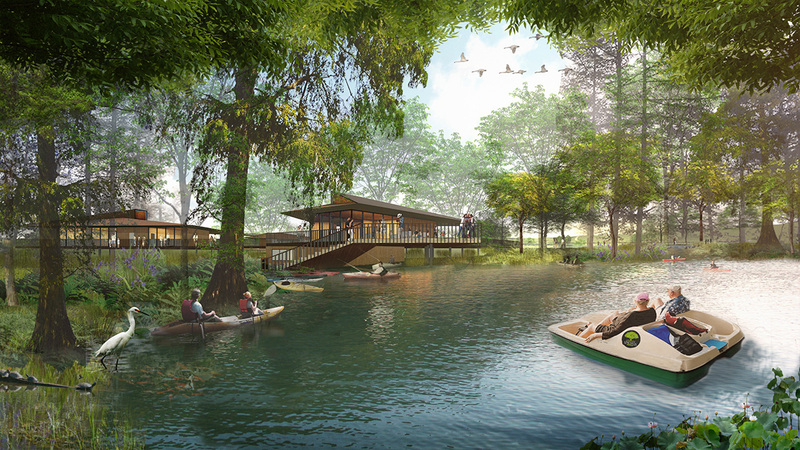 The resulting plan includes heritage gardens, a canopy walk, a welcome center, nature center, event lawn, walking and biking trails, non-motorized boating activities, and a sculpture garden. It is set to open in 2020. 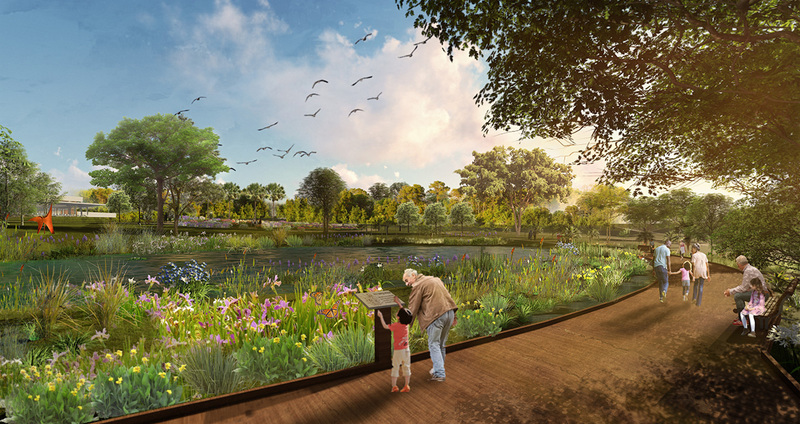 Bonnet Springs Park, from a planning and design perspective, presents a rare opportunity to transform a significantly challenged urban plot of land in an effort to improve Central Florida’s quality of life for generations to come. 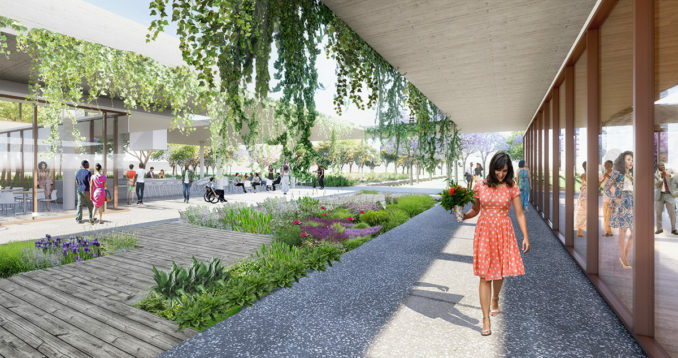 Sasaki’s designs will improve the site’s ecological health, foster unique harmonious architectural design, and set the park up for self-sustaining, economic success. The site certainly was far from “community ready” when the project began. For years the park site remained a vacant brownfield from prior industrial use as one of Central Florida’s major railroad centers, the Lakeland Railyard. Sasaki now faces tough remediation and ecological conditions with 84 acres of land that contain arsenic and petroleum hydrocarbons. The team is using creative, complex remediation strategies and design tactics to convert this damaged land into the “Central Park of Lakeland.” In a bold early move, they will utilize a variety of remediation strategies including creatively stockpiling the most contaminated material into large hills that act as landscape elements completely transforming the park’s future typography. 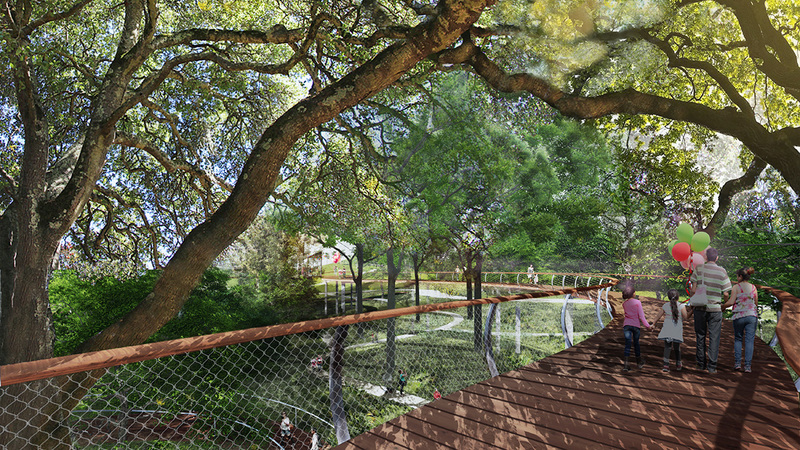 From lowest to highest point, the future park could traverse up to a 90 foot grade change! In addition, a degraded stream corridor carrying comingled storm water runoff and clean water from a sand seep spring will be rehabilitated by diverting storm water into to a series of constructed wetlands to remove pollutants. In terms of the park’s architecture, a series of new buildings will be built within the park, in harmony with the surrounding environment. These added buildings are all intentionally immersed into the landscape contexts—some even partially buried into the landscape’s new hills. 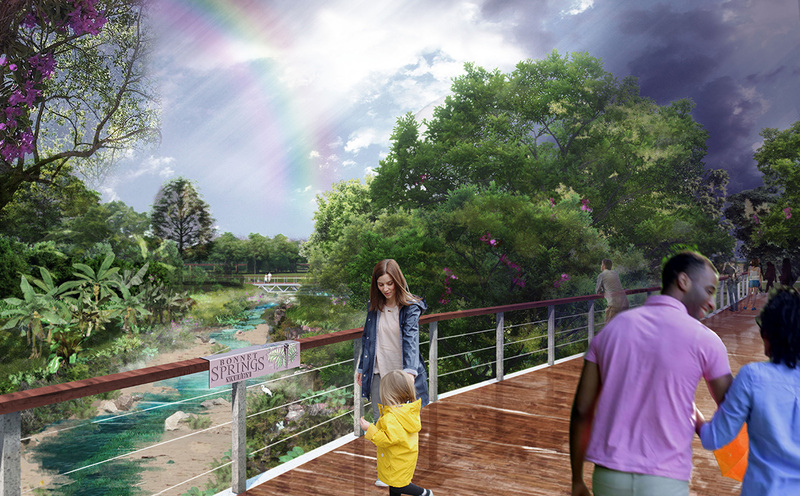 The buildings will create seamless exterior and interior experiences for park visitors—key among them the “Bridge Building,” future home of the park’s anchor institution, Explorations V Children’s Museum. This building is conceived to bridge between two constructed hills on the site, providing stunning rooftop views of the park. While the park is privately funded, the park’s programmatic elements are intentionally being designed to generate income. The park will be made economically sustainable with robust implementation strategies for operations, maintenance, and revenue-generating events and facilities. For example the Explorations V Children’s Museum, will charge an admission fee. 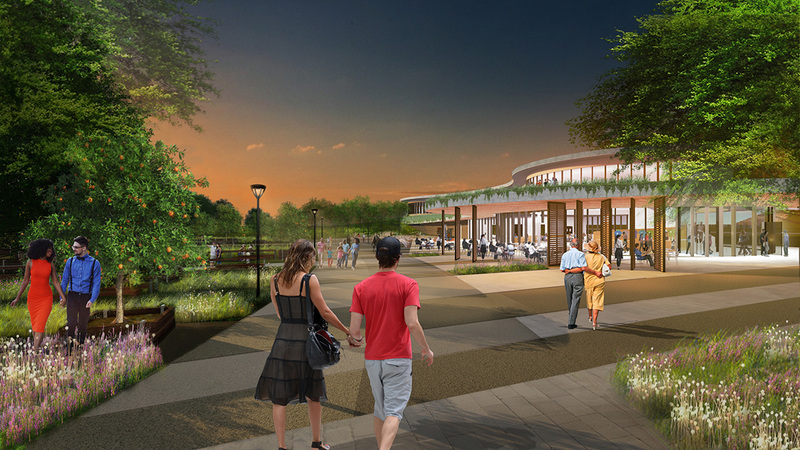 The surrounding area will host outdoor concerts, events and festivals, while other facilities, like the Nature Center, Events Center, and Welcome Center, will boast a cafe, multipurpose rooms for event rental, and a 350-seat banquet hall for weddings, corporate events, and other large gatherings. A perpetual care fund has been established to supplement future park maintenance and capital needs. Within the next 20 years, Polk County’s population is expected to grow to near one million. Sasaki, in partnership with a visionary and innovative client team, looks forward to capitalizing upon the economic, ecological, and community potential for a transformative park in this incredible downtown site.